Cognitive Decline With Age: How Can We Affect It? Home > The Ageing Brain > Cognitive Decline With Age: How Can We Affect It? In the Western world, people are living longer than ever before and the fastest growing subgroup is the "oldest old" (over age 85). So in recent years there has been an explosion of interest and research, attempting to unravel the secrets of age related cognitive decline. The holy grail would be some treatment or strategy that prevents or reverses the changes of cognitive decline and a plethora of suggestions have been made, ranging from those by serious scientists, backed by research, to those of charlatans, tempted by profit and reeling in worried customers with extravagant claims. On the other side of the coin there has also been an abundance of studies into what can cause or worsen the process of brain function decline. What Can Accelerate Cognitive Decline? There are a number of medical conditions that greatly increase the risk of cognitive decline in old age. These include conditions like diabetes, as well as atherosclerosis, the fatty clogging of arteries which can lead to heart attacks and strokes. The "metabolic syndrome" is a sort of blanket term, used to describe a number of common and related conditions that often occur together. These include abdominal obesity, high blood pressure, high blood sugar and triglyceride levels and low levels of the "good cholesterol", HDL. This syndrome is seen as a predictor of a lot of health problems, among them, increased likelihood of cognitive impairment with age, according to a recent study. High fat, copper rich diets have also been associated with accelerated cognitive decline. Disappointingly, for those whose brain function has been a source of lifelong pride, a recent study found that education does not protect against age related memory loss. In this study, adults over 70 with higher levels of education forgot words at a greater rate than those with less education. The researchers suggested that at this age, the highly educated begin to lose the ability to use their schooling to compensate for normal age related memory loss. How Can We Protect Our Brains from Declining as We Move into Old Age? There have been a multitude of suggestions for slowing cognitive decline in old age, but even the most positive reports have yet to find a miracle method for preserving our cognitive function. Interestingly, our own natural hormones may play a part in brain protection. Studies of older women have found that those with high oestrogen levels are less likely to suffer cognitive decline and older men with higher testosterone levels have been found to perform better on cognition tests. These results have led to suggestions that the elderly be prescribed hormone supplements. The problem is that other side effects may outweigh the cognitive benefits. Some lifestyle factors seem to be important. For example, studies have shown reduced cognitive decline amongst older people who walk regularly, who eat a lot of leafy green vegetables and amongst those who eat fish at least once a week. Social factors can also be important. 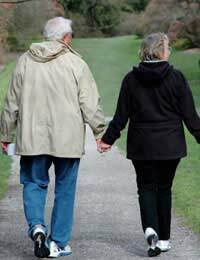 Older people who live with a spouse or other family members and who have a lot of human interactions tend to do better both in terms of physical health and cognition than those who are more isolated in old age. There are several widely marketed non prescription compounds that are claimed to be memory enhancers and treatments for old age related memory decline. One of them, phosphatidylserine, has been shown to produce small increases in some memory functions, for a subset of normal adults whose baseline cognitive performance was below average. Another compound, vinpocetine, that increases brain blood circulation and metabolism, has been shown in a few studies to produce significant improvement on cognitive tests reflecting memory, attention and concentration. Although the results on these compounds are somewhat encouraging, so far the studies have only been preliminary and the improvements have been mild. Antioxidants, like vitamin E, have proved to be a big disappointment. The theory was that they could retard or reverse the damaging effects of free radicals on nerve cells in the brain. But so far, studies have failed to show that vitamin E has any practical benefits in slowing cognitive decline in old age. Can Another Language Make for a Better Brain? There are those who contend that the more active we keep our brains, the less likely they are to let us down in old age. An interesting study that seems to support this view showed that being bilingual seems to prevent some of the cognitive decline seen in monolingual older people. The researchers suggested that the lifelong experience of managing two languages acts to slow the age related decline in the brain's ability to process data despite external distractions. The study subjects had all used two languages since age 10 or earlier, so if you're already older than that, bilingualism may not be of any help to you. But maybe the best way to plan for your children's old age is to teach them an extra language.